Iranian Journal of Radiology - Does Magnetic Resonance Imaging Affect the Microleakage of Amalgam Restorations? Does Magnetic Resonance Imaging Affect the Microleakage of Amalgam Restorations? To Cite: Marti Akgun O, GuvenPolat G, TuranIllca A, Yildirim C, Demir P, et al. Does Magnetic Resonance Imaging Affect the Microleakage of Amalgam Restorations?, Iran J Radiol. 2014 ; 11(3):e15565. doi: 10.5812/iranjradiol.15565. Background: The effect of MRI on microleakage of amalgam restorations is an important health issue that should be considered. If MRI application causes increase of microleakage, amalgam fillings should be reassessed after MRI and replaced if necessary. Objectives: The aim of this study is to compare the effect of magnetic resonance imaging (MRI) on microleakage of class II bonded amalgam versus classical amalgam restorations. Materials and Methods: Class II cavities (3 mm width × 1.5 mm depth) with gingival margins ending 1 mm below the cementoenamel junction (CEJ) were prepared in 40 permanent molar teeth. The teeth were randomly divided into four groups. Cavities in the first and second groups were restored with dentin adhesive and amalgam (bonded amalgam), and those in the third and fourth groups with amalgam only. MRI was performed with the teeth specimens from the first and third groups. All specimens were then thermocycled at 5° to 55° C with a 30-second dwell time for 1000 cycles. The samples were then immersed in 0.5% methylene blue dye for 24 hours and sectioned longitudinally. Dye penetration at the occlusal and gingival margins was quantified by 15× stereomicroscopy. IBM SPSS Statistics ver. 21.0 (IBM Corp., Released 2012., IBM SPSS Statistics for Windows, Armonk, NY: IBM Corp.) and MS-Excel 2007 programs were used for statistical analyses and calculations. “nparLD” module was used for F2_LD_F1 design analysis at R program. P<0.05 was considered statistically significant. Results: In teeth with amalgam filling, there were no significant differences of occlusal and gingival surface microleakage after MRI exposure. Occlusal and gingival surface microleakages were also similar with and without MRI in teeth with bonded amalgam filling. Conclusions: The results of this study suggest that MRI does not increase microleakage of amalgam restorations. According to the definition from the American Dental Association (ADA), dental amalgam (silver-colored filling) is a durable metal alloy of silver, copper and tin, in addition to mercury, which binds these components into a hard, stable substance. The use of amalgams for dental filling is controversial because of the mercury content and release. However, amalgam is still widely used because of its cost, durability, and ease of manipulation (1). Amalgam affords no adhesion to the walls of the cavity preparation, and poor adaptation and lack of adhesion to the dental structure are two disadvantages of amalgam when compared with composite resin restorations (2, 3). The mechanical retention of amalgam often results in further weakening of the remaining tooth structure, and since the mid-1980s, dentin adhesives have been advocated for use in bonding amalgam to tooth structure (4). Improving retention, strengthening restored teeth in vitro, and allowing a more conservative approach to cavity preparation and reduction of microleakage are the reported benefits of using dentin adhesives for amalgam bonding (5). Magnetic resonance imaging (MRI) uses the magnetic properties of hydrogen and its interaction with both a large external magnetic field and radio waves to produce highly detailed images of the human body (6). The demand is increasing for MRI due to its high image quality and lack of known harmful effects. The magnetic field strength used for MRI usually varies between 0.15 to 3 Tesla (T; 1 T=10,000 gauss). In comparison with the earth's gravitational force, 0.5 gauss, this exposure is very high, and the strong magnetic field of MRI pulls on any ferromagnetic metal object in the human body (7). There are numerous studies on mercury release from dental amalgam restorations after MRI, but to our knowledge, only two have evaluated microleakage as an additional factor (8, 9). In a study conducted by Shahidi et al. (8), the results suggested that MRI is not a completely safe technique in patients with amalgam restorations. Likewise, Yilmaz and Misirlioglu (9) have reported that MRI is not completely devoid of effects on amalgam restorations. Most studies to date have concluded that the use of adhesive systems beneath amalgam restoration reduces or prevents micro leakage and makes the cavosurface angle less susceptible to demineralization when compared to varnish. The purpose of this study was to evaluate microleakage of amalgam and bonded amalgam restorations following MRI. Forty extracted caries-free human third molar teeth were prepared for this study. Tissue debris was removed from the teeth and the teeth were stored in distilled water solution. The teeth were numbered 1 to 40 and randomly divided into four groups of 10 teeth each, and class II cavities (3 mm width × 1.5 mm depth) with gingival margins ending 1 mm below the cementoenamel junction (CEJ) were prepared using diamond burs (806314110534014, Medin AS, Czech Republic) under water cooling and using a caliper for measurements. Cavities were restored with dentin adhesive (RelyX™ ARC Adhesive Resin Cement, 3M Espe, Seefeld, Germany) and amalgam (bonded amalgam) (Dispersalloy, Dentsply, VIC, Australia) in the first and second groups, while only amalgam was used for restorations in the third and fourth groups. The alloy powder of amalgam was containing 265 mg Silver, 69 mg Tin, 46 Mg Copper, 4 Mg Zinc and 400 Mg Mercury for 1 spill. The alloy to mercury ratio by mass was approximately 1:1. The amalgams were placed incrementally with condensation towards the cavity walls. The finishing and polishing procedures were completed using finishing and polishing tools (Kerr, CA, USA). Teeth in the first and third groups were then placed into a magnetic field for approximately 20 minute, after which teeth in all groups were subjected to a thermal cycling regimen of 1000 cycles, between 5 and 55° C by using water baths. MRI was performed using a 1.5 T superconductive unit (Magnetom Symphony, Siemens, Erlangen, Germany) with the standard head matrix coil. Teeth were then dried superficially and the roots embedded in chemically activated acrylic resin (PMMA), while the exposed crown and root structure was covered with two coats of nail varnish, leaving a 1-mm window around the cavity margins. The samples were then immersed in 2% methylene blue dye solution for 24 hours. After this, any surface-adhered dye was carefully rinsed away in tap water. To measure the vertical extent of micro leakage, the teeth were bisected longitudinally in a mesiodistal direction with a low-speed diamond saw and the occlusal and gingival regions of the restorations were scored. The dentists who scored the teeth did not have any information about the groups. The sample size of the study was calculated with G*Power (G*Power Ver. 3.0.10, Franz Faul, Universität Kiel, Germany) statistical packages. The required sample size for getting a power of 90% (equal to type II error or β of 10%), type I error (α) of 0.05 and effect size (f) of 0.70 was calculated as 36. It was planned to include nine teeth in each group. To handle probable future exclusion of samples from the study, we enrolled one more tooth to each group that increased the total sample size to 40. The F2_LD_F1 design was used to examine the dental filling groups to determine if there was a difference in the variable values of MRI implementation and surface microleakage. All statistical analysis was conducted using an ANOVA test. Relative treatment effects for paired comparisons were evaluated for factors showing significant differences. Statistical analysis and calculations were carried out using SPSS statistical software ver. 21.0 (IBM Corp., Released 2012., IBM SPSS Statistics for Windows, Armonk, NY: IBM Corp.) and Microsoft Excel 2007, respectively. The “nparLD” module was used for F2_LD_F1 design analysis at program R. A P value < 0.05 was considered statistically significant. Statistical analysis revealed that the variable microleakage values of the dental filling groups (Amalgam and Amalgam + Bonding) were not independent from MRI implementation and surface values (F=0.064, P=0.801) (Table 1). The microleakage values of the dental filling group varied significantly from those of the MRI (+) and MRI (-) groups and were independent of the surface values. Additionally, the surface values were significantly different and independent of those of the dental filling group and MRI implementation (F=5.361, P=0.021 and F=34.955, P<0.01, respectively). The microleakage values of the MRI (-) group were higher than that of the MRI (+) group (Figure 1). Similarly, the probability that the variable gingival surface microleakage values were higher than those of the occlusal surface was calculated as RTE = 0.615 (Table 2). We did not observe any statistically significant difference in the microleakage values after examining double and triple interactions (P > 0.05). 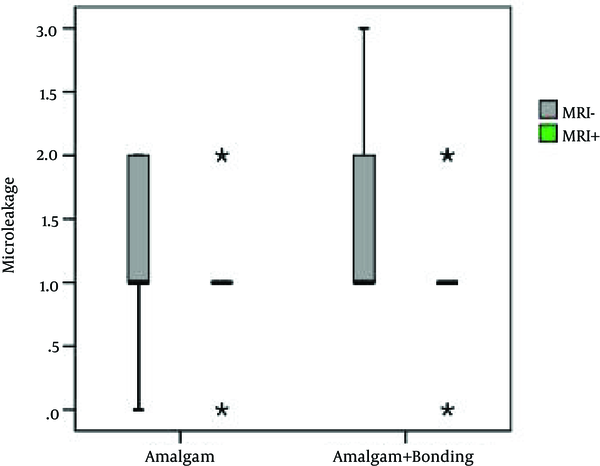 When the interaction between the dental filling and the MRI group was analyzed, Amalgam + Bonding and the MRI (-) group showed a relatively higher effect than the other groups. However, this difference was not statistically significant (F = 0.064, P = 0.801) (Figure 2). Analysis did not reveal any significant difference in the variable micro leakage values of the dental filling group, MRI and surface interactions (F = 0.000, P = 0.987). The probability of obtaining variable microleakage values in indiv with Amalgam + Bonding and in the non-MRI group was higher than that of the other groups and was found to be 0.677 (Table 3) (Figure 3). aANOVA Test statistics are calculated by F2_LD_F1 models. The demand for MRI is increasing due to increasing numbers of examinations of the head and neck regions. There have already been a number of studies that have examined the effects of metals used in dentistry upon MRI (10-13). In some of them, mercury release from dental amalgam restorations after MRI has been investigated (14, 15). Muller-Miny et al. (14) reported that there was no significant increase in mercury release due to MRI. In contrast to the results of this study, Mortazavi et al. (15) indicated that MRI significantly increases mercury release from amalgam restorations. The effect of microleakage of amalgam restorations during MRI is an important health issue that should be considered. Microleakage may be defined as the clinically undetectable passage of bacteria, fluids, molecules, or ions between a cavity wall and the restorative material (16). Clinically, microleakage can lead to staining around the margins of restorations, postoperative sensitivity, secondary caries, restoration failure, pulpal pathology or pulpal death, and partial or total loss of restoration (17, 18). If MRI application causes increase of micro leakage, amalgam fillings should be reassessed after MRI and replaced if necessary. Otherwise, patients may lose teeth due to secondary caries. In the present study, we evaluated the effect of MRI in terms of extent of microleakage of amalgam and bonded amalgam restorations. To our knowledge, there are only 2 other studies on this issue, and based on the results of these studies, MRI is not safe for amalgam restorations. In one of these studies, Shahidi et al. (8) assessed 63 freshly extracted human premolars restored with standard class V preparations on both buccal and lingual surfaces and divided them into three groups with three different high-copper amalgams. Subsequently, the teeth were placed in a 1.5 T magnetic field for approximately 20 minutes. Their result indicated that MRI is not a completely harmless technique in teeth with amalgam restorations. They reported that the main effect of the strong magnetic fields was development of thermoelectromagnetic convection, which is responsible for increased diffusion, grain boundary migration, and vacancy formation, resulting in microleakage. In the same way, another recent study by Yilmaz and Misirlioglu (9) evaluated the effects of a 3 T magnetic field on microleakage of amalgam restorations containing three different types of silver. The authors restored cavities in 60 extracted teeth and exposed the teeth to a magnetic field of 3 T for 20 minutes. They also found that MRI exposure was not completely devoid of effects on amalgam restorations, and they confirmed that the primary risk of MRI arises from the effects of the strong magnetic field on objects containing ferromagnetic materials. Our results, in contrast to those of Shahidi et al. (8) and Yilmaz and Misirlioglu (9), did not indicate any statistically significant differences in the extent of microleakage with or without MRI exposure. A diversity of magnetic field strengths may have caused our results to differ from those of Yilmaz and Misirlioglu (9). We chose to evaluate the effects of 1.5T MRI in our study because 1.5T MRI is currently the most widely used machine, while 3T MRI is known to produce poorer images due to its failure to eliminate imaging artifacts in patients with prostheses and dental implants. Different from Shahidi et al (8), we assessed the effect of MRI on the microleakage of gingival and occlusal surfaces of class II cavities. Class II cavities involve proximal surface of molar teeth. These areas are difficult to clean and collect even more plaque, as a result, dental caries mostly occur on the proximal surface of a tooth and amalgam fillings are mostly applied for this class of cavities. It may have caused our results to differ from those of the study conducted by Shahidi et al.(8). The bonding of amalgam restoration to the tooth is still a controversial topic. Tig et al. (19) have observed the teeth restored with bonded amalgam under the scanning electron microscope and noticed that teeth restored with unbonded amalgam had more spaces and artifacts at the amalgam-tooth structure interface when compared with those that were filled with bonding agent. Ziskind et al. (20) showed that the effect of adhesive does not appear to be a dominant factor in the long term reduction of microleakage, and Fedorowicz et al. (21) concluded that there is no evidence to claim to refute a difference in survival between bonded and non-bonded amalgam restorations either. Murad (22) conducted an evidence-based study assessing the effectiveness of bonded amalgam and concluded that there was a lack of evidence to support an additional benefit of adhesively bonded amalgam compared to non-bonded amalgam. In the present study, occlusal and gingival surface microleakages were similar in teeth with amalgam filling and amalgam+bonding. In both groups, the microleakage values for the gingival surface were significantly higher than those for the occlusal surface. Similar to our study, Jakovljevic et al. (23) evaluated the influence of different bonding agents on the marginal sealing quality of class II amalgam restorations and reported greater microleakage at the gingival margins than the enamel margins. Sharafeddin et al. (24) assessed the microleakage of composite restorations with and without a cervical amalgam base and compared the results of different composites and bonding agents. They reported that microleakage at the gingival margin was greater than that at the occlusal margin. According to our results, MRI does not increase the microleakage of bonded or non-bonded amalgam restorations. Implication for health policy/practice/research/medical education: There are numerous studies on mercury release from dental amalgam restorations after MRI, but to our knowledge, only two have evaluated micro leakage as an additional factor. The results of these studies suggested that MRI is not a completely safe technique in patients with amalgam restorations. On the contrary, according to the results of this study, MRI does not increase micro leakage of amalgam restorations. It is an important topic for those who work with MRI scan professionally, because according to our results, MRI professionals do not need to refer the patients who have amalgam restorations to dental clinics after MRI implementation.